(Nanowerk News) Lasers play a vital role in everything from modern communications and connectivity to bio-medicine and manufacturing. Many applications, however, require lasers that can emit multiple frequencies – colors of light - simultaneously, each precisely separated like the tooth on a comb. This was accomplished using microwave signals, allowing the properties of the comb — including the bandwidth, the spacing between the teeth, the height of lines and which frequencies are on and off— to be tuned independently. 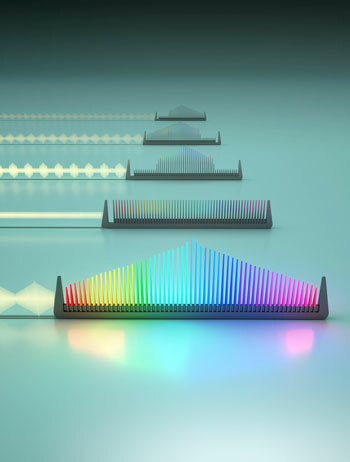 “These compact frequency combs are especially promising as light sources for optical communication in data centers,” said Joseph Kahn, Professor of Electrical Engineering at Stanford and the other senior author of the study. “In a data center – literally a warehouse-sized building containing thousands of computers – optical links form a network interconnecting all the computers so they can work together on massive computing tasks. A frequency comb, by providing many different colors of light, can enable many computers to be interconnected and exchange massive amounts of data, satisfying the future needs of data centers and cloud computing.